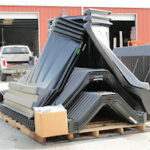 The SmartDitch Maintenance Pack is a proven, simple, and cost-effective solution to permanently repair or maintain problem drainage ditches or stormwater outfalls. Every Public Works & DOT maintenance yard should have SmartDitch on hand to be able to quickly repair blown-out ditch sections. 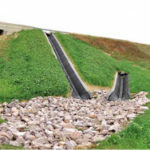 When designing drainage projects with difficult access, remote locations, or uneven terrain and sloped conditions, SmartDitch’s lightweight rugged construction allows for quick installation in the most difficult situations.